Add Ginger to your Favourite Herbs list. Herbosophy's Ginger is powdered from pure Zingiber officinale root and comes to you without fillers, preservatives or additives and is freshly ground and encapsulated for you at order or packaged as loose powder: the choice is yours. 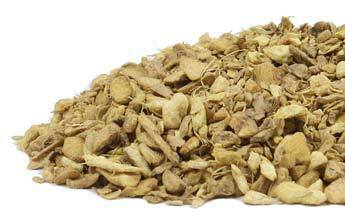 Ginger is traditionally considered by Herbalists to be hot and drying and has been a popular herb Worldwide for culinary, cosmetic and health use. I have found it settles and cleanses the gut, especially during chemo. It is said to be as good as chemo. Lots of stuff on the net about ginger. We consume and enjoy ginger with most of our evening meals. Purchased the capsules essentially to mix with watermelon smoothies and add with a nice tea leaf. I believe that ginger is an excellent contributor to healthy blood. I would rate this product 10/10. My husband doesn't like ginger so I don't add it to food preparation. I'm severely arthritic and find this to be the best way to keep up my daily dose. Quality is excellent and delivery is rapid. good product and a nice change to have fresh ingredients. Product is good, service is excellent. Best quality ginger capsules I've come across. Great to use after a workout. I pop a capsule when I eat a lot of 'cool' and 'cold' fruit and vegies as recognise in TCM. This stops my knees feeling weak "jelly knee", especially when using stairs. Writing in response to Joseph dated 18th May, I have sent thru an email with more info for you, so I hope this helps. The ginger caps work a treat and would recommend them initially over the ginger powder to make herbal tea. I have bought the powder to mix with other extracts (to fill empty vegetable caps). I have healed successfully from mentioned illness, taking natural supplements, changing my diet and beliefs. I could not see myself without Herbosophy ginger now, as I make a point of consuming a lot of organic raw garlic, onions of all kinds, and the ginger caps. This trilogy works as a powerful tonic. I am going to make order of the garlic caps also to help with this. removing stems and leaves. Slice the banana. remaining oil in a wok or heavy frying pan. center of the noodles and spoon in the beef. with the mint sprigs and spices on the side. the excess. Preheat the oven to 350F. ginger and crystallized ginger and mix well. paper, and cool. Cut into slices and serve. lime rind. Place skillet over medium heat. minute. Remove from heat and skim off foam. mixture on bottom and sides of a 9 pie plate. mixture. Whip cream until soft peaks form. once, for 6 minutes, or until browned lightly. chops to the skillet and reduce the heat to low. the edges. Remove from heat. while adding the milk in a thin stream. the custard. Let the custard cool. Set aside. the water and pour over the yeast. Set aside. the yeast and stir into the ginger mixture. start the fermentation. Cover with a cloth. drunk immediately and will keep indefinitely. simmer gently until tender, about 20 minutes. Add ? cup sugar, stir well, and return to a boil. from heat, cover and let stand overnight. sugar and store in tightly covered glass jars. and mix with baking soda and warm water. molasses and corn syrup and beat for 1 minute. to soften the ginger and mellow the flavor. squeeze out the lemon juice, and set aside. heat. Add the split peas and cook for 1 minute. cook for 5 minutes, or until lightly browned. large serving bowl. Toss well and serve. and stir into creamed mixture (do not overmix). ginger cheese and pineapple mint cheese. 14 oz Young ginger; peeled and sliced 1/8"
procedure 3-4 times to get rid of the spiciness. dissolved. Cool and return the syrup to the jar. (measured at the beginning of this recipe). wherever Jewish foods are sold. the candy into about 25 squares or diamonds. few minutes, so watch carefully toward the end. sugar dissolves and mixture comes to boil. 295?F, stirring occasionally, about 15 minutes. beans are just tender (roughly 20 - 30 minutes). about 2 to 3 minutes, stirring frequently. chicken into thin strips and add to peppers. toss gently to coat. Serve over rice. pepper, allspice, and cloves in a plastic bag. ginger to the fat that was leftover in the skillet. freshly chopped parsley on top of the stew. asparagus, and fresh cherry tomatoes.